4H is a nationwide youth development program for ages 5-18. While most people picture livestock or agriculture, 4H offers many project areas from citizenship to photography, clothing & textiles to cooking, and much more. 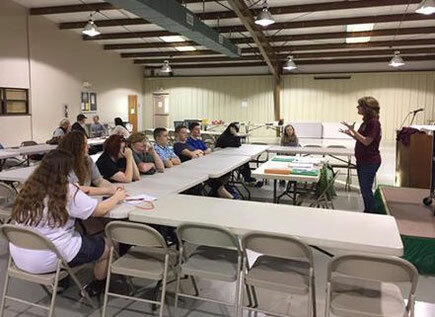 In addition to other 4-H clubs in Alcorn County's program, EAGLE 4H began in 2006 as an extension of the opportunities available through EAGLE Homeschool Association. Eagle's meeting topics rotate to meet the needs and interests of our members; however, we place emphasis on community service, leadership development, and helping our youth gain confidence and skills while fostering a love for serving and working well with others. Youth ages 14-18 have the opportunity to attend a three day event at Mississippi State in the spring where they compete in contests, attend various workshops, and have some fun along the way. Visitors are always welcome at our meetings which are normally held the fourth Tuesday of the month at 4:00 at the Alcorn County Extension Center. Homeschool band is available for ages 10-18 through MASTER Music Academy of Corinth. Students meet once per week for band class, and then practice at home using computer software that provides full accompaniment. They submit assignments to the instructor for evaluation and feedback. Concerts are often performed in conjunction with the other MMA bands of Tupelo and Oxford. Homeschool Legal Defense Assocation (HSLDA) "Through the years, HSLDA’s primary goal has remained the same—to bring together a large number of homeschooling families so that each can have a low-cost method of obtaining quality legal defense. Today, HSLDA gives tens of thousands of families the freedom to homeschool without having to face legal threats alone. Through many families sticking together, we have been able to keep the cost of a year’s membership close to the rate that a family would have to pay for an hour of an attorney’s time almost anywhere else. " Answers in Genesis Apologetics ministry especially regarding creation, evolution, and science. They have the Creation Museum and Ark Encounter near Cincinnati which some EAGLE families have visited. Cathy Duffy Reviews: Curriculum reviews. Also guides parents in choosing curriculum based on both the teacher's and student's needs. All About Learning Press: Articles for teaching multi-sensory learners and those with learning challenges. iXL and xtramath.org (free) and many other sites use online activities to reinforce grade level material. To submit when student is applying for a driver's license.